Note: The day after the shooting at UCC on Oct. 1, 2015, I wrote a letter to the world that quickly went viral across the globe. Two years later, this is my sequel to the original commentary. This post was featured in the New Review and at nrtoday.com. Two years ago you were introduced to Roseburg. On October 1, 2015, our tranquil valley became known for the tragedy that the face of evil brought to our town. Our name became part of a list of cities whose schools became the seat of violence, and like all cities that bear the same mark, we didn’t want to be known for the horror of that day. We hoped you’d see us for the way we came together and for how deeply we care. We want you to know that we are stronger than ever, and our resolve is rooted as deep as the Douglas fir that covers the hills throughout our county. Like most of our community, I didn’t sleep that night. When the unthinkable happened, I couldn’t shut off my brain. Instead of sleeping I began to process grief. At 4 a.m. I shuffled into my husband’s office and penned a piece, pouring my troubled heart onto the page. My message began a discussion between friends and strangers. It became evident that there were far more people who love this peaceful community than those who feel trapped by this small-town life. As details began to unfold, stories of those we lost became our stories. We sat in a collective waiting room for those whose wounds weren’t fatal but still, we recognized that bits of their lives were stolen. We prayed with the families of both survivors and victims. We baked cupcakes, welded yard signs, printed decals, poured coffee, lit candles and held vigils. Local churches opened their doors for the countless volunteers who came simply to comfort. Home-grown businesses donated, collected and sacrificed while the world watched us grieve for a short while. During that first week, I had several conversations with different media outlets. 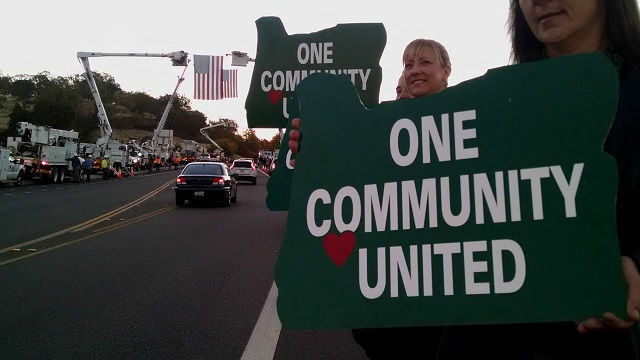 From a local Seattle station to a reporter from CNN, the question was the same: What makes Roseburg different? The question was merely for the interview because they had already noticed on their own. As the list of tragedies he had covered was recited, one reporter told me this, “No one has ever been as kind and cordial to us as the people here.” He wondered if we were anxious to have the media lights dimmed. I nodded and assured him that the first order of business was to create a safe place to heal. As often happens during times of grief, there are those who return to their lives as if nothing happened. Media loaded their trucks and moved on to the next story. Through memorials, prayer vigils and fundraisers, we leaned on one another and those who had reached in when it was too painful to reach out. We woke up soon after to a “new normal” where the quiet left us feeling raw and disoriented. So much loss so fast, and to this day, there isn’t a part of this that makes sense. We’re here two years later and still standing. We’ve come together in ways we hadn’t before and survived the pain as well as the controversy. When public figures and outside forces tried to change the conversation, we stayed strong. As the reports of the investigation were released just a few weeks ago, opinions of how the information should be handled varied. We still have our own viewpoints and passions to be sure, but we still have our community. We have inspiration from the lives we lost and the wounded who fought to stay alive. From the first responders to the emergency room personnel to the long-term caregivers, their stories have become our stories. The pastors and neighbors who have sat with the tearful have offered comfort through unimaginable loss. Community leaders continue to meet in order to chart a course in hopes that we can continue to heal and grow. We’re here, caught in a place where we’d like to forget that day and mindful that there is so much we need to remember, like being kind and gracious to each other. We can disagree and be angry yet find it in our hearts to be civil. We can actively give and peacefully listen to those still carrying the scars of that day.